Did you know scientists estimate that by 2050 there will be more plastic than fish in the world’s oceans? According to the Plastic Free July Foundation, 8 million metric tons of plastic ends up in the oceans every year. Just take a moment to let that sink in. They have a plan for helping us commit to reducing that number. About half of all plastic produced is for single-use or disposable items such as packaging. July may be half over, but it’s not too late to “choose to refuse” single-use plastic this month. 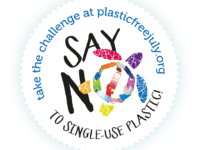 Sign up for the Plastic Free July challenge and then make a commitment to try it all year long! When you sign-up this month, you’ll be joining over 2 million people from 150 countries in making a difference. The Plastic Free site has lots of tips for living plastic-free and helping to spread the word. By bringing your own reusable shopping bags, remembering reusable coffee cups and water bottles, and avoiding pre-packaged fruit and vegetables, you can help make a difference. What are you waiting for? Start saying “no” to single-use plastic today.